The Studebaker Avanti was designed in 1961 in a house in the Palm Springs desert. Raymond Loewy leased this two-room building as a place for the designers he had selected to work and sleep. Loewy and his family lived nearby in a house built in 1946-47 that was designed by local architect Albert Frey. Loewy's design team consisted of experienced designers and former Loewy employees, John Ebstein and Bob Andrews, as well as a young student from Art Center College of Design in Pasadena named Tom Kellogg. The team gathered in Palm Springs in this studio leased for the purpose of developing the new car design. Each team member had a role: Andrews and Kellogg handled the sketching, Ebstein oversaw the project, and Loewy served as the creative director. 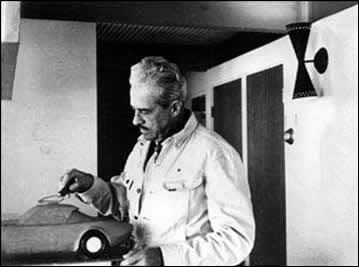 Loewy in the desert studio with one of the clay models. The 2-room studio tract house in Palm Springs.